Mosul remains at war. Although the conflict in most parts of Iraq has largely subsided  the uneasy peace punctured only sporadically by spurts of bloodshed  it isn't over in Mosul. Al-Qaeda and other insurgent groups remain a force in this majority Sunni, ethnically and religiously mixed northern city, Iraq's third largest. The question is, Why? What is it about Mosul, the capital of Nineveh province, that has sustained an insurgency that has largely (with the exception of northeastern Diyala province) died out in most of the country? Why has this city of some 2 million people become the site of al-Qaeda's last stand in Iraq? Then there is the Syria connection. Saddam Hussein recruited many of his high-ranking Baath Party members and army generals from Mosul's élite Sunni families, many of whom sought refuge in Syria after the 2003 U.S. invasion and the fall of the dictator. According to several Iraqi generals from the national police and the army, some of these die-hard Saddam loyalists have been funneling funds and fighters  both foreign and Iraqi  across the 185-mile Syrian border with Nineveh. The military officials say they have captured many such suspected insurgents, but did not provide concrete figures. Nor would they say if these detentions have increased of late. "We have arrested a lot, but there's a lot of corruption here in Iraq," says Colonel Moslet Ahmad Attiyeh, commander of the national police's Salah battalion. "The terrorists pay their way out and are released," he says, whereupon they join other insurgents displaced from al-Qaeda's former stronghold of Anbar and the still volatile Diyala who have found refuge in Mosul. American commanders in Mosul agree that insurgents unseated from elsewhere in Iraq have followed a "path of least resistance" to this northern city. 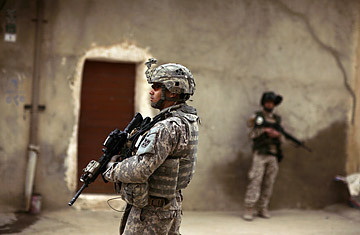 "There were 28 U.S. battalions in Baghdad during the surge as well as lots of Iraqi battalions. Up here there was one battalion," says Brigadier General Robert B. Brown, deputy commander of the 25th Infantry Division. "So where are [the insurgents] gonna go?" Insufficient boots on the ground, coupled with a lack of basic services such as electricity and water, high unemployment and a disenfranchised Sunni population that until recently was governed by members of the minority Kurdish population, made the city kindling for the insurgency. But things are changing. American troops in Mosul have doubled over the past several months, according to Col. Gary Volesky, brigade commander of the 3rd Heavy Combat Team, 1st Cavalry Division. January's provincial polls also brought a Sunni party, Al-Hadba, to power, a development that is expected to lessen some elements of the insurgents' support base. But to destroy it, the population must actively turn against subversive elements within it, and either fight or flush them out in the same way that Sunni tribal sheiks in Anbar switched sides and allied with the Americans against al-Qaeda in their province, a movement known as the Sahwa. That hasn't happened yet, General Brown says, because Mosul's diverse makeup has proved difficult to foster such a movement. The Anbar Sahwa fell into line behind tribal sheiks, whose word is law, but Nineveh is not exclusively a tribal society. General Abbas says the former Kurdish-dominated local government did not encourage the promotion of a Sunni Sahwa movement but hopes that will change when the new government is seated. The additional hope is that community-based job-creation projects like trash removal and electricity restoration will lessen the temptation of unemployed men to drift toward insurgents who pay them to join their ranks. Still, members of an intimidated population must also feel secure enough to know that if they turn in an insurgent, they won't face revenge attacks. "You can go kill and capture [insurgents] all you want; it doesn't matter. The people have got to turn against them, and they haven't yet in Mosul because they're intimidated," Brown says. "And I don't blame them." Last week a joint U.S. and Iraqi military operation was launched in southwest Mosul as part of the province-wide Operation Nineveh Resolve, aimed at rooting out insurgents and finding weapons caches. Platoons fanned out along rubbish-strewn streets as Blackhawk helicopters circled overhead to provide support. But the residents of Mosul have experienced this type of neighborhood "clearing" operation many times before. "We've never been able to really hold the gains, and so these people have seen clearance after clearance, after clearance," says Colonel Volesky. And so Mosul will see such operations again and again, hoping that something will eventually stick.